See the dolphins, manatees and stingrays playing right from your balcony. This exclusive 9th. floor Bahia Pointe waterfront corner unit features a spacious 1150 sq. ft. with a private balcony. The large windows and floor to ceiling sliding glass doors from all rooms afford incredible water views. The apartment is completely furnished and decorated, features a king size bed in the master bedroom and a queen size bed in the 2nd. bedroom. The balcony has an unbelievable view to the Gulf of Mexico, Tampa Bay and the famous Sunshine Skyway Bridge. See the cruise ships leaving the Port of Tampa. The condo features an assigned parking space and is equipped with absolutely everything like free Wi-Fi, A/C, cable TV, Satellite radio and a fully equipped kitchen and washer/dryer. Cookware and utensils are also provided, and all linens and towels. The living room and bed room have mirror walls. The building features a waterfront heated pool and whirl pool, a fishing dock, library, fitness room, assigned parking space. I'm married to my lovely wife Olga and we have no kids. We keep our places meticulous clean and in shape. We speak English and German. St. Petersburg Beach (2 minute drive): St. Pete Beach offers miles of white, sandy beaches on the Gulf of Mexico. It offers Scooter - Boat- and Jet ski rental's, Miniature Golf, Volleyball, Biking, Fishing, Swimming, Snorkeling and Diving, Water skiing, Boating, Parasailing. But it also offers a unique variety of shops, specialty stores, Disco's, excellent Restaurants, services and events designed to make your Florida vacation or shopping excursion memorable. Fort De Soto Park (5 minute drive): Fort De Soto is located only a 5 minutes drive from ISLA DEL SOL. The entire island is now Fort De Soto Park, a Pinellas county park which offers fine beaches, fishing, nature trails, camping, boating, and much more. It was voted no. 2 in America's Top Beaches for 2003 by Dr. Stephen P. Leatherman (Dr. Beach) Located in St. Pete Beach, The Don CeSar Beach Resort & Spa has everything. The Don CeSar Resort (4 minutes drive) Known as Florida's Legendary Pink Palace since 1928, the luxury resort is revered internationally for its sprawling, sugar-white beach, unparalleled dining, rejuvenating Beach Club & Spa, fabulous fishing, children's program, nearby tennis and golf and award-winning meeting facilities. Unbelievable views from every window and balcony makes you feel like to be on a cruise ship. You can see the dolphins, manatees right from the balcony. My husband and I rented this condo over the holidays. It was so perfect that we will be returning for the same time frame the next holiday season. The condo itself is gorgeous. Very spacious, light-filled and beautifully furnished. The beds are incredibly comfortable, the kitchen is well stocked with everything needed for cooking and the bathrooms are nice and roomy. The well appointed corner balcony overlooking the bay is absolutely delightful. Really great views of boats and the water and dolphins and so many species of birds that we lost count. The pelicans were endlessly entertaining! The condo's pool and hot tub were very pleasant and well maintained. We never had trouble finding a lounger and enjoyed chatting with other visitors and owners. It's a really friendly, quiet and laid-back place.. Parking was easy and always available and the 9th floor location was a snap with readily available elevators (stairs, too, if you are so inclined). The development's fitness room was well equipped and the area around the condo is perfect for walkers. The owners are very kind and responsive and we simply can't say enough positive about our stay. Thank you and we are looking forward to our return. It was a pleasure having you and your husband as our guests and I look forward to see you back here this year. We enjoyed having you and your husband as our guest and we look forward to see you again soon. We very much enjoyed the stay! A really nice apartment , fully equipped with everything you need, with a great view, perfectly located to St Pete, the beaches, a beautiful. nature refuge and all trips to the North, South or East, with a very nice, caring owner! We very much hope to come back soon and can only recommend this apartment to all Florida lovers! We were so fortunate to have you as guests. Hopefully you'll be back in the area again soon. Isla del Sol is an island community on 350 acres of beautifully manicured tropical gardens surrounded by the waters of Boca Ciega Bay. It is located on the southernmost tip of St. Petersburg. Isla del Sol consists of a variety of different condominium buildings in a resort environment that offers a million dollar clubhouse, country style living with several pools, tennis facilities and a golf course. Free to use for our guests are the beautiful white sand beaches with mature coconut palms, the heated pool, spa, fishing dock, fitness center, the board walk and the park. We also have 'The Shoppers Village' complete with a bank, post office, several restaurants, clothing shops, a florist, gift shops as well as many other upscale shops. For Members, the island boasts an 18-hole championship golf course, the Tennis Center consisting of nine lighted soft, Har-Tru courts, and the Isla del Sol Yacht and Country Club. Isla is conveniently located to a variety of recreational facilities above and beyond our local amenities. We have Ft. DeSoto just a short drive to the South. The Gulf Beaches are a 3-minute drive to the West. If you like golf, tennis or boating Isla has a country club that consists of The Isla del Sol Golf Course; it is an exceptional 18-hole championship layout. Challenging fairways, beautiful bunkered greens, shimmering lakes and gardens enhance the beauty and heighten the challenge of the course. The Tennis Center consists of nine lighted soft, Har-Tru courts, first class instruction, clinics, member events, round robins, mixed doubles, active singles and doubles competitions, and other events held throughout the year. If you are a boater we have a yacht club as well. It boasts a 78- slip Yacht Basin for sailboats as well as large motor yachts and small runabouts alike. It is not uncommon to see the muted pink roseate spoonbills feeding in the mornings in our tidal creeks. There are also numerous birds to be seen, such as the great blue heron, cormorants, Florida wood storks, the majestic osprey as well as many other sea birds feeding and resting in and around one of several of our lakes located throughout the island. Our quaint Spanish named streets meander through beautiful stately royal palms, queen palms, oak trees as well as hundreds of other tropical specimens. Our architecture is comprised of high-rise, mid-rise, 2, 3 and 4 story buildings as well as townhouses all with a Mediterranean flair. 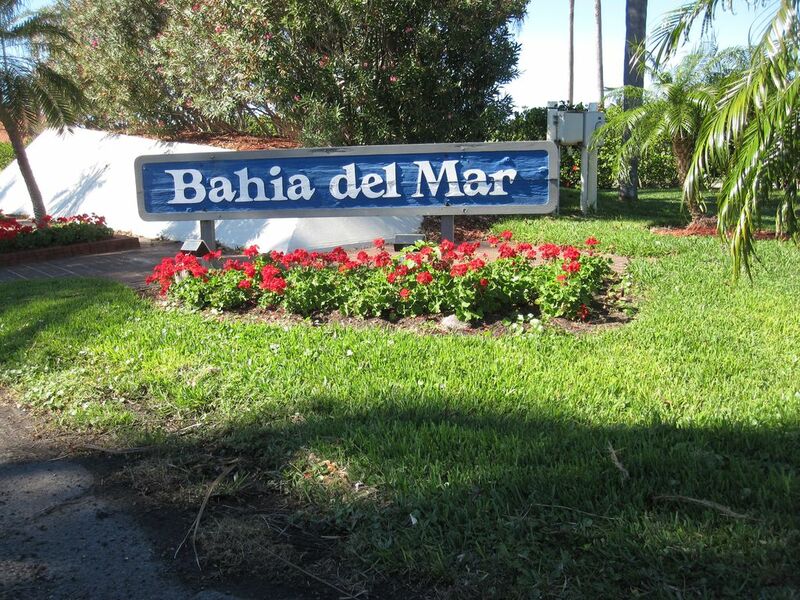 Our communities consist of Isla Key, La Puerta del Sol, Casa del Mar, Palma del Mar, Bahia del Mar and Vista de Oro. These are very distinct communities, all of varied character and architectural style. Our island is truly paradise. A collection of excellent restaurants and varied shopping is only a short drive away with St. Petersburg's mainland just one bridge to the East and the barrier island of St. Pete Beach one bridge to the West. Our apartment (1,200 sqf) is non smoking (smoking on the balcony is permitted); accommodates max. 4 guests. Living / dining room, kitchen and bedroom overlook the water, with a very nice unobstructed view of the Gulf of Mexico, Boca Ciega Bay and the famous Florida sunsets. See the dolphins and boats going by from the living room and the balcony. Heated pool, Spa, Fishing pier, Fitness room, Park settings, Board walks, Reserved under building parking space, 24 hours security and so much more..